The March meeting was attended by 12 members. Jim Cook, president, let the business meeting. Jack Putnam, treasurer, gave the treasurers report. As of this date we have 20 paid members. Anyone who has not paid their $20 dues, please send them to Jack as soon as possible. Jim Cook discussed the club mission statement. Jim would like input from any club member on ideas for programs. 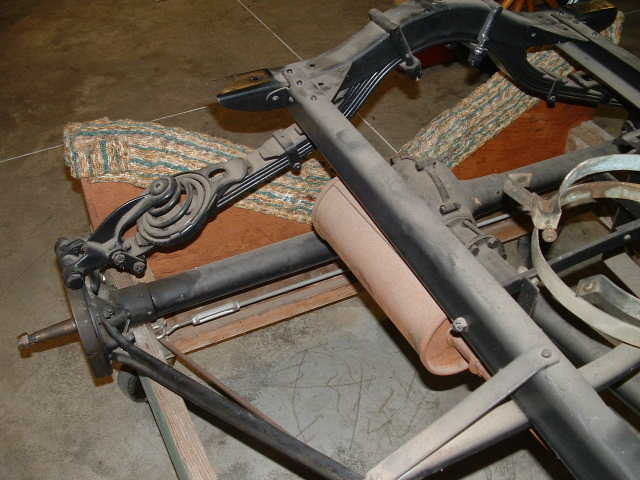 We all have Model T's, lets use them, show the world what we have done to preserve history. Take it upon yourself to put a tour together, long or short, plan on a dinner outing, plan on a cookout, or plan on taking the T's to festival. I challenge all of you to come up with one tour for the year. If we get everyone with on tour we will have enough to choose and choice is fun. I think I will put a tour togeter for driving around the block,,, would anyone like to join? Now tha is the first idea,,, someone come up with driving around 2 blocks. The last weekend in August, the Findlay Historical Society would like to have our club memebers bring our Model T's to their opening. Keep that date in mind. Further details will be coming later. It was reported that Russ Nolting had surgery and was doing fine. Our prayers for a rapid recovery are with Russ and his family. Russ, we hope to see you soon. Rod LaFollette is doing great. 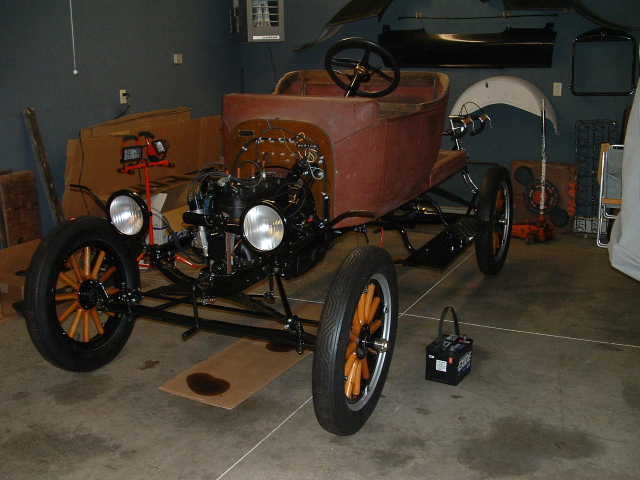 We thank him for the donation of a 1914 touring that was raffled off at the meeting. Make sure you come to the meetings. You never know what's going to happen. Bob Torbet and Bill Mack gave a short report on The Model T Ford Club International's 52nd Annual Meeting on board the Rememberance od the Sea. There were 107 people who joined the group for this annual meeting. If anyone is interested in "Win the 1916 Golden Eagle" see Bob Torbet for tickets at $20 each. The drawing will be held July 20, 2006 and the proceeds will go toward the 2006 National Tour. 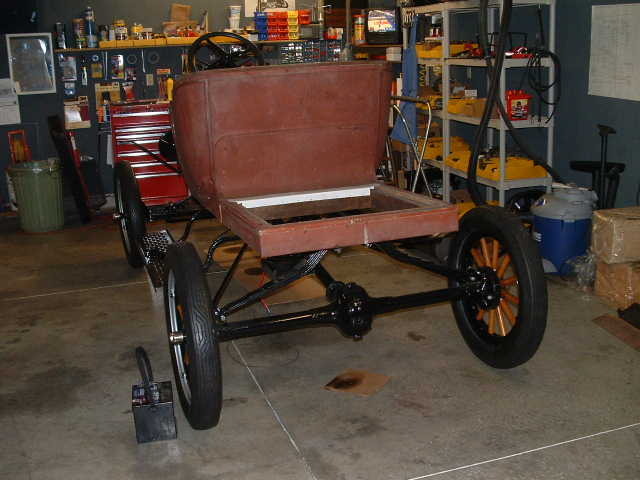 Most of you know that I like to-do it myself when it comes to my Model T. I only buy parts when I can't find or repair an original. And sometimes I make my own "new parts". I was starting to restore a transmission for my latest project and needed a reverse drum. I had bought several used trnasmissions only to find the reverse drums were bad. I could vvuy a new one for about $300 or....... I could buy a chunk of steel and make one. Why not, what could it hurt. Well, I have finished it, and attached a couple of photos. Here is a list of the estimated costs! Tendons cut 1 nicked, no stitch in this one! 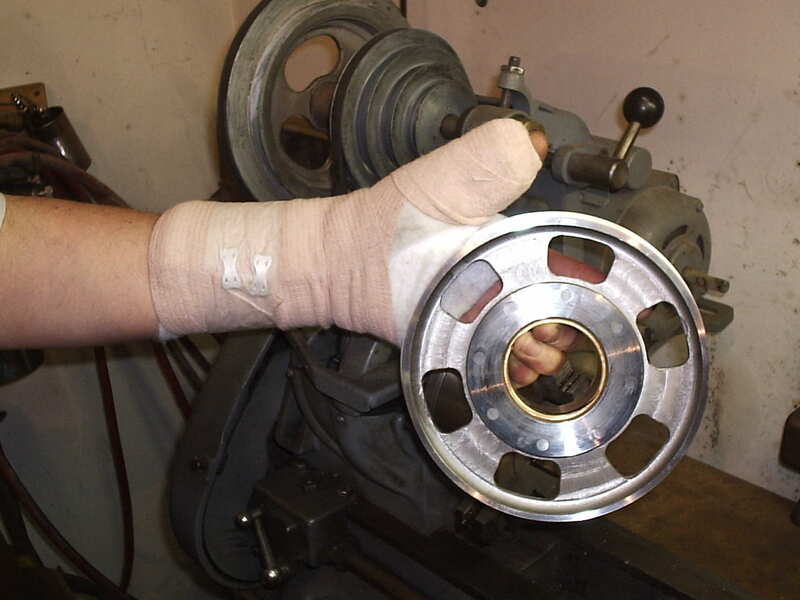 The drum was not done when I cut my thumb, so when I found out I had to have surgery, I went out and finished it. I figured that if I hurt it again I could get a 2 fer 1 deal. 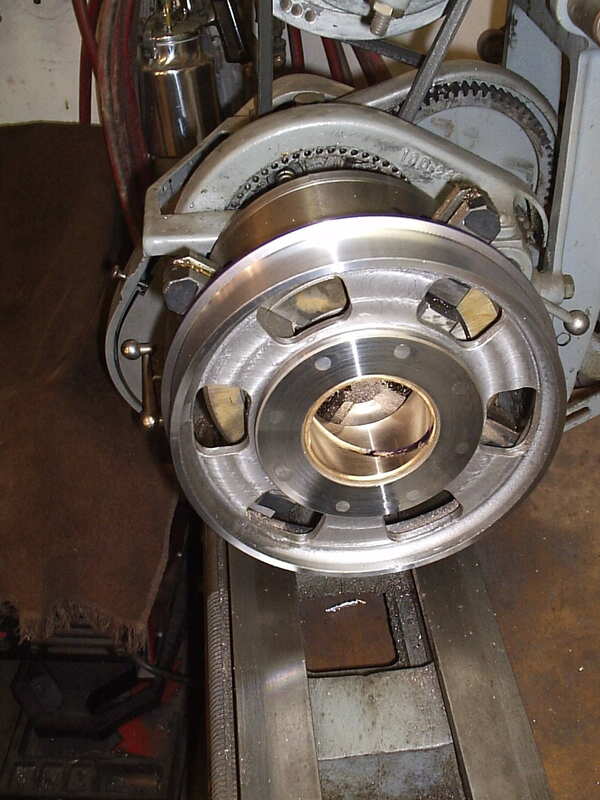 When the doctor and Cheri let me back in the shop, in about two weeks, I plan to take a few pounds off the flywheel, install the rest of the bushings and see how it all fits together. 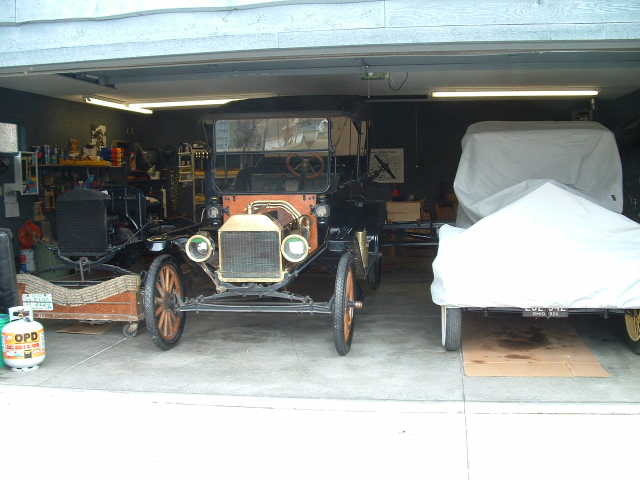 The 1914 touring above is Bill Mack's most recent acquistion. The car was bought at a sale last year and has now been resold to Bill. It will need some work to get it into touring condition; but, we'll all help him out to make sure that it happens soon. I met today with people from the Hancock County Historical Society. They want to hold a VINTAGE only car show on August 26, 2006 in Findlay. A one day event at the museum, strictly early autos, no hot rods, nothing modified, no muscle types and nothing newer than 1932. Strictly a fun day, no fee, no judging, no trophy, 10 to 3 pm event. This will be the first of an annual event. They would like our club to participate. Their thinking 30 - 50 cars would be fantastic. The jamboree this year is hosted by the Country Roads T & A Club. The touring will be in the Marietta, Ohio area, with trips into West Virginia. They have torus planned for foru days and the registration form allows for a pick and choose list for most of the meals; so, you can plan on attending as many days as you would like. Of course, we'd all like to see you for as many days as possible. I have a copy of the registration form for the 18th Annual Ohio Model T Jamboree to be held September 1-4, 2006. Please let me know if you'd like a copy. Children and grand-children are encouraged to attend. They have special youth activites planned as well as an exceptional banquet arranged with the young in mind. Their banquet will be held at the same location as the closing banquet, just in a different room. So please bring the kids!! 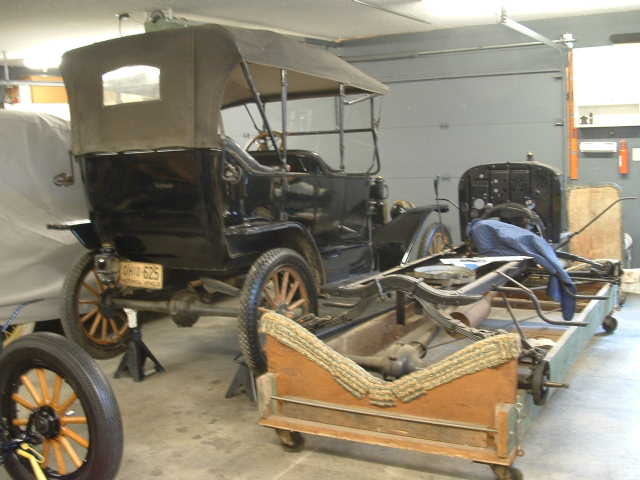 Rod LaFollette donated a picture "Fabulous Fords" to the Club (not the 1914 touring as previously reported). Jack is building a trophey case for all these collectables. He did not say when this would happen.